We handpicked only the best barrel sauna for this highly selective shortlist, based on our extensive barrel sauna reviews. 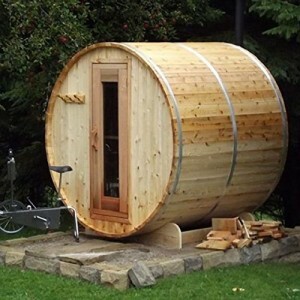 The word Sauna has its origins in Finland, but saunas have come a long way since their inception the newest design is the Barrel Sauna. Barrel saunas are really the high end of saunas yet some of them have even maintain their traditional heating methods –wood burning stoves heating volcanic rocks. Great for weight loss helping a person burn between 300 – 400 calories max in mere 30 minute session. While the sauna has been around for thousands of years in one form or another the barrel saunas were first built in the 1980’s. The exact time and place is unknown but is it speculated they first appeared in Canada. With their easy assembly and tubular design, they get hotter faster and are designed to specifically be used outside. Highly resistant to cold weather they are a great way to get those winter aches out. With a rugged build and beautiful finish, they make a fine addition to any backyard. With the utmost craftsmanship required for the building of their elements making this list of the 10 best barrel saunas was a long and hard process. Almost Heaven’s sauna’s have scored five places on the list of top 10 best barrel sauna’s and it should come as no surprise they take the number one spot on the list. While the Allwood Barrel Sauna #220-WHC beats this item for price by almost a thousand dollars there is just no substitute for the beauty aroma and weather resistant of cedar. For what looks like a very uniform design not all barrel saunas are the same and Almost Heaven Saunas 4-Person Canopy Barrel Sauna sets itself aside with its details. One of which is the small 2 person porch where you can sit outside for a quick cool down before getting back in. This porch can also be used to set towels and drinks while inside. 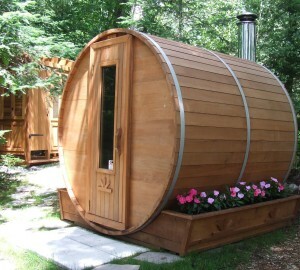 Due to the cylindrical design and reduced cubic feet of air this sauna is going to get very hot very quickly. With all of the great design work on the it should not be a surprise that the inside reflects the same attention to details. The interior benches run the full length of the room so either 4 people can sit or 2 people can recline laying down the full length of the interior. For heat this model uses the highly powerful 4.5kq heater. This heater does require a 220v plug –the type of plug you typically see used for a washer dryer. If you don’t have a plug like this already in your home you will need to get one installed by a certified electrician. The barrel kit comes partially assembled and once it arrives, it and can be put together by one or two people in a matter of hours. The barrel rests on two molded plastic cradles that can be anchored to a deck for additional security. This sauna comes to you at an unbeatable price. This is the least expensive of all the four person saunas on the list. While most Saunas have an electrical heater that tops out around 140f this sauna has a wood stove inside of it which allows you to get as hot as combustion will allow. 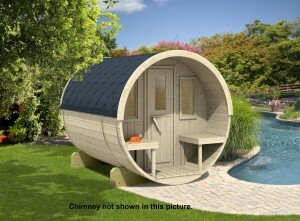 Part of the low price, however, is that this sauna is not made from cedar but rather Nordic spruce. This isn’t a huge draw back however after decades this item may start to see some wear. To ensure against leaks this item comes with roofing, something that sets All Wood Outlet’s Saunas apart. This 6 person sauna was one of the first in the line of Almost Heaven Sauna’s –developed close to over 30 years ago. The 220v electrical means it is going to require a special wall outlet. The exterior is of made of light red cedar and the self-closing door is made from tinted glass to help keep the heat in. 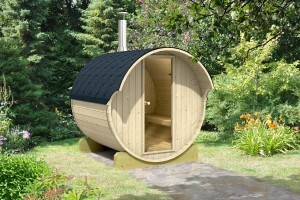 This is a great big sauna for an extremely fair price. The most affordable sauna on the list, this 2 person canopy sauna offers all the greats extras as the Almost Heaven Saunas 4-Person Canopy but with just slightly less room. It does have all the drawbacks as well needing a 220v plug required. 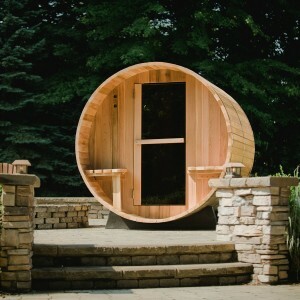 This is a great sauna for a couple or single person. 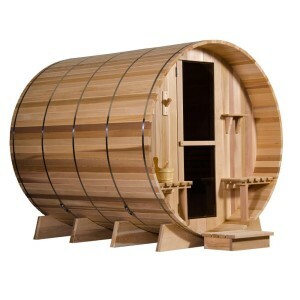 At the number 5 spot on the list of 10 ten best barrel saunas is this 4 person unit with outside robe or towel rack. What is kind of cool about this item is that when you order it you do have the option to choose either an electrical heater or a wood burning stove –both come with volcanic rocks, you get a good sauna which you can use for your choice of dry or wet heat. Another entry on the list form Allwood, this hoy barrel seats 4 people and comes with a 3m wood heater and stainless steel chimney. Much like the other sauna from Allwood this item is made from Nordic spruce over cedar. Honestly if was made from cedar for this price it would bump this item a few places on the list. You do get the benefit of a sturdy model with reinforced roofing. Almost Heaven is a great company that proudly boasts from West Virginia that does some really nice work with western Canadian red cedar. The stainless-steel bands compliment the beauty of the wood and show the artisanship. Whether you are looking for weight loss, relaxation or just some good old fashion sore joint relief this sauna is an okay deal. 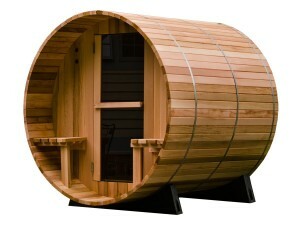 The last three entries on the list of 10 best barrel saunas are all 6 person saunas. All three wound up at this end of the list because they all carry a very hefty price tag. This is the least expensive of the. Beaten by the Barrel Sauna 6’ due to price point this sauna has pretty much identical features. Except this model does have a heater that you can set with an 8 hour time delay –so your sauna is ready for you right when you make it home from a long day of work. The price tag is what puts it at this end of the list. This big 7×7 sauna comes with a wood fired stove and insulated tempered glass door. This is not a bad model just the fact that it is on this list is a testament to how good it is. The price is a bit much but this is only sauna on this list that backs itself up with a 5-year warranty. At the very end is the most expensive sauna on this list. With cedar construction this item has only one drawback that I can see: The support cradles are made of cedar so you must make sure that your sauna is not placed on grass or area where it could get stuck in standing water. Cedar is highly rot resistant, in fact it is one of the most rot resistant woods out there, but rot resistant does not mean “never rots” and if you’ve got a wet back yard you may be in for a little trouble. You get all the same features that come standard with Almost Heaven’s Line of Saunas, 8 hour delay timer, stainless steel heater and bands, 240v heater. 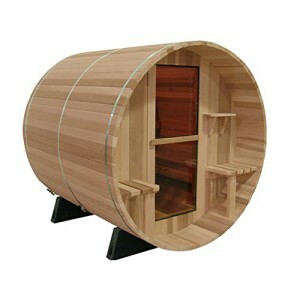 The 10 best barrel saunas presented on this barrel sauna review list took hours of deliberation, investigation and just plain getting hot and sweaty. After hours of lamenting perspiration and attentive relaxation we were finally able to put together this list of the best of the best barrel saunas.